Get a bicycle. You will certainly not regret it, if you live. - Mark Twain. I thought this might be the best quote for Paris-Roubaix Sunday. We posted stage six winner Enric Mas' Team Quick-Step report with the race results. Primoz Roglic and Team LottoNL-Jumbo have won the overall classification in the Vuelta al Pais Vasco. In a tough and final stage, Roglic was pressured all the time but managed to hold on and defend his lead despite a heavy crash. For the 28-year-old Slovenian it is his third win of the season and his first win in a World Tour stage race. For Team LottoNL-Jumbo it is the tenth victory this spring. In the short stage with no less than eight climbs it was a real race from the beginning. After only two kilometres there was a massive crash in which also leader Roglic was involved. Roglic was brought back by his Team LottoNL-Jumbo teammates to the front peloton after which he got seriously tested by the competition. On the steep final climb, Roglic could no longer keep up with the attacking Landa, but he managed to secure the overall win. For Team LottoNL-Jumbo it is the second overall victory in a World Tour stage race. Last year George Bennett won the Tour of California. The last stage of the Itzulia Basque Country race saw an outstanding team performance of BORA – hansgrohe with four riders finishing inside the top 15. While Austrian Champion Gregor Mühlberger spent most of the day in a breakaway, Emanuel Buchmann moved up to fourth overall after a strong effort on the final climb. Also Patrick Konrad gained some places in final general classification to finish the Basque Country Tour in tenth position. 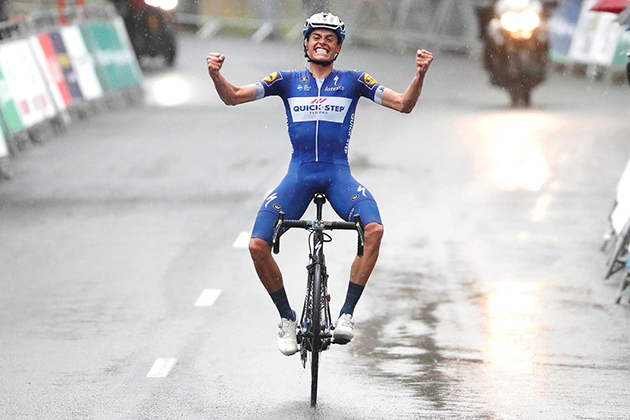 Enric Mas won the final stage. The 58th edition of the Itzulia Basque Country race concluded today with the queen stage. A short but tough one, packed with no less than eight categorised climbs, included the iconic Arrate as the summit finish. With Emanuel Buchmann being sixth in the overall, the team tactic was today to support the young German rider as best as possible to secure or improve his position in the overall. After 35km of racing, 14 riders, including BORA – hansgrohe rider Gregor Mühlberger, launched an attack and distanced themselves from the peloton with a maximum gap of three minutes. The race was marked by pouring rain all day but the peloton tried to close the gap and with 40 remaining the gap came down to 1:20. At this moment Gregor Mühlberger went up the road with three other riders. With 24km remaining, all three BORA – hansgrohe climbers, Konrad, Buchmann and Großschartner were together at the front of the reduced bunch, teammate Gregor Mühlberger was still in the breakaway with 42 seconds gap. The race headed into the final climb of the day, while the four escapees led the race. With 5km remaining, E. Mas distanced himself from the former breakaway. Gregor Mühlberger served as relay station for his teammates Emanuel Buchman and Patrick Konrad, all showed a strong performance and were able to stay always at the front of the chasing group. In the final kilometres, the race went on fire as many of the favorites got dropped. E. Mas (Quick-Step Floors) was the strongest today and took the stage win some seconds ahead of M. Landa (Team Movistar). BORA – hansgrohe rider Emanuel Buchmann crossed the line in seventh position and moved up to fourth place in the final overall ranking. Teammate Gregor Mühlberger finished the race in 8th position and Patrick Konrad took 10th place and was able to move up to 10th in the overall. Team BORA – hansgrohe won the team classification of the Itzulia Basque Country race. Dan McLay handily won the final stage of Circuit Cycliste Sarthe – Pays de la Loire on Friday. The Briton made it look easy, crossing the finish line in Sablé with a bike length on Samuel Dumoulin (AG2R La Mondiale) and Marc Sarreau (Groupama – FDJ). It’s the third win of the season for EF Education First – Drapac p/b Cannondale and McLay’s first win in #PinkArgyle. “It’s good to go into a short break and training period with the winning feeling,” said McLay. Logan Owen was part of a five-rider escape that slipped away shortly after the peloton rolled out of Brûlon for the 189-kilometer stage. Five became three after the first intermediate sprint at kilometer 28. Owen spent the next two hours ahead of the bunch with Perrig Quemeneur (Direct Energie) and Jetse Bol (Manzana Postobon). The trio stretched out their advantage to 3’45 before the Trek-led peloton tightened the leash. Owen’s work afforded his teammates an easier ride in the peloton as no one looked to EF Education First – Drapac p/b Cannondale to chase. A mechanical took Owen out of the breakaway before the race entered the stage four finishing circuit for six times around the 12.5-kilometer lap. The peloton caught Qasim and Bol on the final lap and a big bunch came to the line to contest the stage. 7 April, 2018, Santa Rosa, California (USA): The Flanders Classics series concludes next week with a competitive and well-rounded BMC Racing Team line-up heading to Brabantse Pijl on Wednesday (11 April). BMC Racing Team will have a strong group of riders at the start line of the one-day race, Sports Director Klaas Lodewyck said. "I think we have a pretty strong team for Brabantse Pijl. We aren't going into the race with one of the outright favorites but we do have a good group of riders who can all fight for a result. We have some strong guys who can look to go into the breakaway and from there we can protect them." "Then, we also have Dylan Teuns who I think can do well on the final local lap. The last 800 meters of the race are more or less uphill so I think we can try to make a selection there and go for a result. We want to try to get the win and although it will not be easy, I think with the team we have we can definitely try to do something," Lodewyck explained. 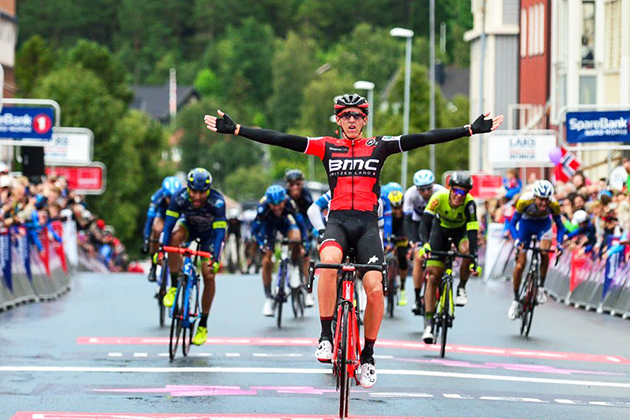 Dylan Teuns winning the first stage of the 2017 Arctic Race of Norway. Brabantse Pijl will be a key race for Teuns ahead of the Ardennes Classics. "I'm really motivated for the next four races on my program and that starts on Wednesday at Brabantse Pijl. I have prepared well and Vuelta Ciclista al Pais Vasco was a good part of that build up. I am feeling good and I think I have been racing well so far this season." "Overall, I am really happy with where I am at right now and so I will be going into the race with a lot of ambition. This will be one of my goal races so I will be going there ready to fight for a good result," Teuns said.